Fatou Bensouda, newly sworn in as prosecutor of the International Criminal Court, is getting a lot of advice. Much of it is well-meaning. As the first African and the first woman to hold the post, Bensouda has rightly inspired much good feeling. For those who disagreed with her predecessor, one of her assets is, apparently, that she is not Luis Moreno Ocampo. (Bensouda is smart enough to know that, while Ocampo is taking his lumps, he did some good things during his tenure. Moreover, as Ocampo’s Deputy, Bensouda cannot entirely disassociate herself from the past nine years.). Some of the advice is sensible. Thus, many have suggested—correctly, in my view—that Bensouda should appoint a deputy who has significant experience in overseeing complex investigations, as one step toward enhancing the professionalism of the office’s investigative activity. She should exploit her considerable diplomatic skills to nourish improved relationships with constituencies both within and outside the court. She should structure her office so that she can focus on larger strategic questions while delegating to capable senior staff responsibility for day-to-day functions. And yet, a number of recommendations, while understandable, carry their own risks. Foremost among the suggestions Bensouda has received is to prosecute cases outside Africa, starting with Syria. This, some suggest, will address the resentment many feel toward a court that has picked on easy prey in Africa while shying away from equally, if not more, culpable perpetrators of ICC crimes elsewhere. There are good reasons to pursue meritorious cases beyond Africa. Indeed, if the court does not ultimately pursue grave crimes in all regions of the world where they occur, it will not fulfill its mission. But in seeking geographic “balance,” Bensouda faces real constraints of policy and law. The first perpetrator charged from outside Africa may well allege that the prosecution is tainted by Bensouda’s desire to appease critics of the court’s perceived “Africa bias.” After all, it could be claimed, Bensouda was officially endorsed by the African Union, she comes from Africa, and she has every reason to curry favor with her diplomatic supporters. However baseless these accusations may be, Bensouda will likely encounter them. Rather than seeking to “balance” one perceived bias against another, Bensouda should simply follow the law and the evidence to charge the most responsible perpetrators of the most serious crimes within the court’s jurisdiction, regardless of where they occur. The advice to seek cases outside Africa also faces legal obstacles. For better or worse, Bensouda cannot pursue a case for crimes in Syria until and unless the UN Security Council refers them to the ICC. The same is true for crimes committed in or by persons from other countries which have, as yet, not ratified the Rome Statute, such as Israel. And while she should—and I am sure will—examine closely the situation in countries already under the court’s purview—such as Afghanistan, Colombia and Georgia—genuine legal questions about admissibility, gravity, and provability will continue to pose challenges to the building of successful ICC prosecutions. (Similar questions have arisen in the cases already on the Court’s docket.). So, yes, over time, the ICC should and will prosecute cases emerging from outside Africa. And yet, encouraging the perception that location is a factor in the Prosecutor’s decision process would not well serve the court. A second line of advice builds on the first: work to widen membership in the court, so that more countries come under the ICC’s jurisdiction. This makes sense, but it’s unfortunately directed to the wrong audience. While Bensouda has a key role in making the court successful and persuading states to join, the ultimate decision rests with national governments. The inequality of global accountability in practice—the fact that war criminals in weak states are far more likely to face justice than those in major powers—sullies the ICC’s reputation and limits its effectiveness. Universal ratification is and should be a goal of the court as a whole, and of the Assembly of States Parties, the body of countries that have signed up to the Rome Statute that established the ICC. Bensouda can help make the argument. But she alone cannot compel China, Russia, India and the United States to sign up. A third recommendation has been that Bensouda reset her office’s fraught dialogue with NGOs, who have variously collaborated with, and criticized, the court. A step back to reflect on the division of labor is timely. But it should be clear that civil society organizations bear their fair share of responsibility for making these relationships work. No one should expect unanimous agreement on matters as complicated and controversial as the prosecution of international crimes. 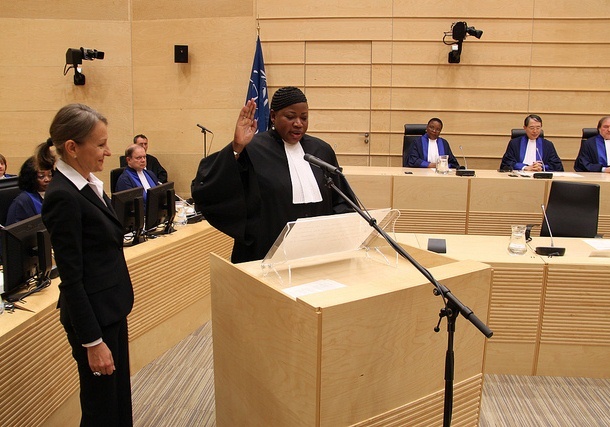 In short, as she enters office, Fatou Bensouda needs not just advice, but also help from her many friends: to build the court’s case for adequate resources and state cooperation, to launch more domestic prosecutions so the court is not alone in filling the impunity gap, and to manage often-outsized expectations of what this vital, but still young, public institution can accomplish. James A. Goldston is the founding executive director of the Open Society Justice Initiative, which promotes rights-based law reform and the development of legal capacity worldwide. A leading practitioner of international human rights and criminal law, Goldston has litigated several groundbreaking cases before the European Court of Human Rights and the United Nations treaty bodies, and has served as Coordinator of Prosecutions and Senior Trial Attorney in the Office of the Prosecutor at the International Criminal Court.